"LCD" redirects here. For other uses, see LCD (disambiguation). Not to be confused with LED (light-emitting diode). Glass substrate with ITO electrodes. The shapes of these electrodes will determine the shapes that will appear when the LCD is switched ON. Vertical ridges etched on the surface are smooth. A liquid-crystal display (LCD) is a flat-panel display or other electronically modulated optical device that uses the light-modulating properties of liquid crystals. Liquid crystals do not emit light directly, instead using a backlight or reflector to produce images in color or monochrome. LCDs are available to display arbitrary images (as in a general-purpose computer display) or fixed images with low information content, which can be displayed or hidden, such as preset words, digits, and seven-segment displays, as in a digital clock. They use the same basic technology, except that arbitrary images are made up of a large number of small pixels, while other displays have larger elements. LCDs can either be normally on (positive) or off (negative), depending on the polarizer arrangement. For example, a character positive LCD with a backlight will have black lettering on a background that is the color of the backlight, and a character negative LCD will have a black background with the letters being of the same color as the backlight. Optical filters are added to white on blue LCDs to give them their characteristic appearance. LCDs are used in a wide range of applications, including LCD televisions, computer monitors, instrument panels, aircraft cockpit displays, and indoor and outdoor signage. Small LCD screens are common in portable consumer devices such as digital cameras, watches, calculators, and mobile telephones, including smartphones. LCD screens are also used on consumer electronics products such as DVD players, video game devices and clocks. LCD screens have replaced heavy, bulky cathode ray tube (CRT) displays in nearly all applications. LCD screens are available in a wider range of screen sizes than CRT and plasma displays, with LCD screens available in sizes ranging from tiny digital watches to very large television receivers. LCDs are slowly being replaced by OLEDs, which can be easily made into different shapes, and have a lower response time, wider color gamut, virtually infinite color contrast and viewing angles, lower weight for a given display size and a slimmer profile (because OLEDs use a single glass or plastic panel whereas LCDs use two glass panels; the thickness of the panels increases with size but the increase is more noticeable on LCDs) and potentially lower power consumption (as the display is only "on" where needed and there is no backlight). OLEDs, however, are more expensive for a given display size due to the very expensive electroluminescent materials or phosphors that they use. Also due to the use of phosphors, OLEDs suffer from screen burn-in and there is currently no way to recycle OLED displays, whereas LCD panels can be recycled, although the technology required to recycle LCDs is not yet widespread. Attempts to increase the lifespan of LCDs are quantum dot displays, which offer similar performance as an OLED display, but the Quantum dot sheet that gives these displays their characteristics can not yet be recycled. An LCD screen used as a notification panel for travellers. Each pixel of an LCD typically consists of a layer of molecules aligned between two transparent electrodes, and two polarizing filters (parallel and perpendicular), the axes of transmission of which are (in most of the cases) perpendicular to each other. Without the liquid crystal between the polarizing filters, light passing through the first filter would be blocked by the second (crossed) polarizer. Before an electric field is applied, the orientation of the liquid-crystal molecules is determined by the alignment at the surfaces of electrodes. In a twisted nematic (TN) device, the surface alignment directions at the two electrodes are perpendicular to each other, and so the molecules arrange themselves in a helical structure, or twist. This induces the rotation of the polarization of the incident light, and the device appears gray. If the applied voltage is large enough, the liquid crystal molecules in the center of the layer are almost completely untwisted and the polarization of the incident light is not rotated as it passes through the liquid crystal layer. This light will then be mainly polarized perpendicular to the second filter, and thus be blocked and the pixel will appear black. By controlling the voltage applied across the liquid crystal layer in each pixel, light can be allowed to pass through in varying amounts thus constituting different levels of gray. Color LCD systems use the same technique, with color filters used to generate red, green, and blue pixels. LCD in a Texas Instruments calculator with top polarizer removed from device and placed on top, such that the top and bottom polarizers are perpendicular. Note that colors are inverted. The optical effect of a TN device in the voltage-on state is far less dependent on variations in the device thickness than that in the voltage-off state. Because of this, TN displays with low information content and no backlighting are usually operated between crossed polarizers such that they appear bright with no voltage (the eye is much more sensitive to variations in the dark state than the bright state). As most of 2010-era LCDs are used in television sets, monitors and smartphones, they have high-resolution matrix arrays of pixels to display arbitrary images using backlighting with a dark background. When no image is displayed, different arrangements are used. For this purpose, TN LCDs are operated between parallel polarizers, whereas IPS LCDs feature crossed polarizers. In many applications IPS LCDs have replaced TN LCDs, in particular in smartphones such as iPhones. Both the liquid crystal material and the alignment layer material contain ionic compounds. If an electric field of one particular polarity is applied for a long period of time, this ionic material is attracted to the surfaces and degrades the device performance. This is avoided either by applying an alternating current or by reversing the polarity of the electric field as the device is addressed (the response of the liquid crystal layer is identical, regardless of the polarity of the applied field). A Casio Alarm Chrono digital watch with LCD. Displays for a small number of individual digits or fixed symbols (as in digital watches and pocket calculators) can be implemented with independent electrodes for each segment. In contrast, full alphanumeric or variable graphics displays are usually implemented with pixels arranged as a matrix consisting of electrically connected rows on one side of the LC layer and columns on the other side, which makes it possible to address each pixel at the intersections. The general method of matrix addressing consists of sequentially addressing one side of the matrix, for example by selecting the rows one-by-one and applying the picture information on the other side at the columns row-by-row. For details on the various matrix addressing schemes see passive-matrix and active-matrix addressed LCDs. Until Gen 8, manufacturers would not agree on a single mother glass size and as a result, different manufacturers would use slightly different glass sizes for the same generation. The thickness of the mother glass also increases with each generation, so larger mother glass sizes are better suited for larger displays. The origins and the complex history of liquid-crystal displays from the perspective of an insider during the early days were described by Joseph A. Castellano in Liquid Gold: The Story of Liquid Crystal Displays and the Creation of an Industry. Another report on the origins and history of LCD from a different perspective until 1991 has been published by Hiroshi Kawamoto, available at the IEEE History Center. A description of Swiss contributions to LCD developments, written by Peter J. Wild, can be found at the Engineering and Technology History Wiki. In 1888, Friedrich Reinitzer (1858–1927) discovered the liquid crystalline nature of cholesterol extracted from carrots (that is, two melting points and generation of colors) and published his findings at a meeting of the Vienna Chemical Society on May 3, 1888 (F. Reinitzer: Beiträge zur Kenntniss des Cholesterins, Monatshefte für Chemie (Wien) 9, 421–441 (1888)). In 1904, Otto Lehmann published his work "Flüssige Kristalle" (Liquid Crystals). In 1911, Charles Mauguin first experimented with liquid crystals confined between plates in thin layers. In 1922, Georges Friedel described the structure and properties of liquid crystals and classified them in 3 types (nematics, smectics and cholesterics). In 1927, Vsevolod Frederiks devised the electrically switched light valve, called the Fréedericksz transition, the essential effect of all LCD technology. In 1936, the Marconi Wireless Telegraph company patented the first practical application of the technology, "The Liquid Crystal Light Valve". In 1962, the first major English language publication on the subject "Molecular Structure and Properties of Liquid Crystals", by Dr. George W. Gray. In 1962, Richard Williams of RCA found that liquid crystals had some interesting electro-optic characteristics and he realized an electro-optical effect by generating stripe-patterns in a thin layer of liquid crystal material by the application of a voltage. This effect is based on an electro-hydrodynamic instability forming what are now called "Williams domains" inside the liquid crystal. In 1964, George H. Heilmeier, then working at the RCA laboratories on the effect discovered by Williams achieved the switching of colors by field-induced realignment of dichroic dyes in a homeotropically oriented liquid crystal. Practical problems with this new electro-optical effect made Heilmeier continue to work on scattering effects in liquid crystals and finally the achievement of the first operational liquid-crystal display based on what he called the dynamic scattering mode (DSM). Application of a voltage to a DSM display switches the initially clear transparent liquid crystal layer into a milky turbid state. 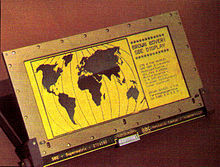 DSM displays could be operated in transmissive and in reflective mode but they required a considerable current to flow for their operation. George H. Heilmeier was inducted in the National Inventors Hall of Fame and credited with the invention of LCDs. Heilmeier's work is an IEEE Milestone. In the late 1960s, pioneering work on liquid crystals was undertaken by the UK's Royal Radar Establishment at Malvern, England. The team at RRE supported ongoing work by George William Gray and his team at the University of Hull who ultimately discovered the cyanobiphenyl liquid crystals, which had correct stability and temperature properties for application in LCDs. On December 4, 1970, the twisted nematic field effect (TN) in liquid crystals was filed for patent by Hoffmann-LaRoche in Switzerland, (Swiss patent No. 532 261) with Wolfgang Helfrich and Martin Schadt (then working for the Central Research Laboratories) listed as inventors. Hoffmann-La Roche then licensed the invention to the Swiss manufacturer Brown, Boveri & Cie which produced TN displays for wristwatches and other applications during the 1970s for the international markets including the Japanese electronics industry, which soon produced the first digital quartz wristwatches with TN-LCDs and numerous other products. James Fergason, while working with Sardari Arora and Alfred Saupe at Kent State University Liquid Crystal Institute, filed an identical patent in the United States on April 22, 1971. In 1971, the company of Fergason, ILIXCO (now LXD Incorporated), produced LCDs based on the TN-effect, which soon superseded the poor-quality DSM types due to improvements of lower operating voltages and lower power consumption. Tetsuro Hama and Izuhiko Nishimura of Seiko received a US patent dated February 1971, for an electronic wristwatch incorporating a TN-LCD. In 1972, the first wristwatch with TN-LCD was launched on the market: The Gruen Teletime which was a four digit display watch. The same year, the first active-matrix thin-film transistor (TFT) liquid-crystal display panel was prototyped in the United States by T. Peter Brody's team at Westinghouse, in Pittsburgh, Pennsylvania. In 1973, Sharp Corporation introduced the use of LCD displays for calculators, and then mass-produced TN LCD displays for watches in 1975. Other japanese companies soon took a leading position in the market of wristwatch like Seiko and its first 6-digit TN-LCD quartz wristwatch. A particular type of color LCD was invented by Japan's Sharp Corporation in the 1970s, receiving patents for their inventions, such as a patent by Shinji Kato and Takaaki Miyazaki in May 1975, and then improved by Fumiaki Funada and Masataka Matsuura in December 1975. TFT LCDs similar to the prototypes developed by a Westinghouse team in 1972 were patented in 1976 by a team at Sharp consisting of Fumiaki Funada, Masataka Matsuura, and Tomio Wada, then improved in 1977 by a Sharp team consisting of Kohei Kishi, Hirosaku Nonomura, Keiichiro Shimizu, and Tomio Wada. However, these TFT-LCDs were not yet ready for use in products, as problems with the materials for the TFTs were not yet solved. In 1983, researchers at Brown, Boveri & Cie (BBC) Research Center, Switzerland, invented the super-twisted nematic (STN) structure for passive matrix-addressed LCDs. H. Amstutz et al. were listed as inventors in the corresponding patent applications filed in Switzerland on July 7, 1983, and October 28, 1983. Patents were granted in Switzerland CH 665491, Europe EP 0131216, U.S. Patent 4,634,229 and many more countries. In 1980, Brown Boveri started a 50/50 joint venture with the Dutch Philips company, called Videlec. Philips had the required know-how to design and build integrated circuits for the control of large LCD panels. In addition, Philips had better access to markets for electronic components and intended to use LCDs in new product generations of hi-fi, video equipment and telephones. In 1984, Philips researchers Theodorus Welzen and Adrianus de Vaan invented a video speed-drive scheme that solved the slow response time of STN-LCDs, enabling high-resolution, high-quality, and smooth-moving video images on STN-LCDs. In 1985, Philips inventors Theodorus Welzen and Adrianus de Vaan solved the problem of driving high-resolution STN-LCDs using low-voltage (CMOS-based) drive electronics, allowing the application of high-quality (high resolution and video speed) LCD panels in battery-operated portable products like notebook computers and mobile phones. In 1985, Philips acquired 100% of the Videlec AG company based in Switzerland. Afterwards, Philips moved the Videlec production lines to the Netherlands. Years later, Philips successfully produced and marketed complete modules (consisting of the LCD screen, microphone, speakers etc.) in high-volume production for the booming mobile phone industry. The first color LCD televisions were developed as handheld televisions in Japan. In 1980, Hattori Seiko's R&D group began development on color LCD pocket televisions. In 1982, Seiko Epson released the first LCD television, the Epson TV Watch, a wristwatch equipped with a small active-matrix LCD television. Sharp Corporation introduced dot matrix TN-LCD in 1983. In 1984, Epson released the ET-10, the first full-color, pocket LCD television. The same year, Citizen Watch, introduced the Citizen Pocket TV, a 2.7-inch color LCD TV, with the first commercial TFT LCD display. In 1988, Sharp demonstrated a 14-inch, active-matrix, full-color, full-motion TFT-LCD. This led to Japan launching an LCD industry, which developed large-size LCDs, including TFT computer monitors and LCD televisions. Epson developed the 3LCD projection technology in the 1980s, and licensed it for use in projectors in 1988. Epson's VPJ-700, released in January 1989, was the world's first compact, full-color LCD projector. In 1990, under different titles, inventors conceived electro optical effects as alternatives to twisted nematic field effect LCDs (TN- and STN- LCDs). One approach was to use interdigital electrodes on one glass substrate only to produce an electric field essentially parallel to the glass substrates. To take full advantage of the properties of this In Plane Switching (IPS) technology further work was needed. After thorough analysis, details of advantageous embodiments are filed in Germany by Guenter Baur et al. and patented in various countries. The Fraunhofer Institute in Freiburg, where the inventors worked, assigns these patents to Merck KGaA, Darmstadt, a supplier of LC substances. In 1992, shortly thereafter, engineers at Hitachi work out various practical details of the IPS technology to interconnect the thin-film transistor array as a matrix and to avoid undesirable stray fields in between pixels. Hitachi also improved the viewing angle dependence further by optimizing the shape of the electrodes (Super IPS). NEC and Hitachi become early manufacturers of active-matrix addressed LCDs based on the IPS technology. This is a milestone for implementing large-screen LCDs having acceptable visual performance for flat-panel computer monitors and television screens. In 1996, Samsung developed the optical patterning technique that enables multi-domain LCD. Multi-domain and In Plane Switching subsequently remain the dominant LCD designs through 2006. In the late 1990s, the LCD industry began shifting away from Japan, towards South Korea and Taiwan. In 2007 the image quality of LCD televisions surpassed the image quality of cathode-ray-tube-based (CRT) TVs. In the fourth quarter of 2007, LCD televisions surpassed CRT TVs in worldwide sales for the first time. LCD TVs were projected to account 50% of the 200 million TVs to be shipped globally in 2006, according to Displaybank. In October 2011, Toshiba announced 2560 × 1600 pixels on a 6.1-inch (155 mm) LCD panel, suitable for use in a tablet computer, especially for Chinese character display. Since LCD panels produce no light of their own, they require external light to produce a visible image. In a transmissive type of LCD, this light is provided at the back of the glass stack and is called the backlight. While passive-matrix displays are usually not backlit (e.g. calculators, wristwatches), active-matrix displays almost always are. Over the last years (1990 — 2017), the LCD backlight technologies have strongly been emerged by lighting companies such as Philips, Lumileds (a Philips subsidiary) and more. CCFL: The LCD panel is lit either by two cold cathode fluorescent lamps placed at opposite edges of the display or an array of parallel CCFLs behind larger displays. A diffuser then spreads the light out evenly across the whole display. For many years, this technology had been used almost exclusively. Unlike white LEDs, most CCFLs have an even-white spectral output resulting in better color gamut for the display. However, CCFLs are less energy efficient than LEDs and require a somewhat costly inverter to convert whatever DC voltage the device uses (usually 5 or 12 V) to ≈1000 V needed to light a CCFL. The thickness of the inverter transformers also limits how thin the display can be made. EL-WLED: The LCD panel is lit by a row of white LEDs placed at one or more edges of the screen. A light diffuser is then used to spread the light evenly across the whole display. As of 2012, this design is the most popular one in desktop computer monitors. It allows for the thinnest displays. Some LCD monitors using this technology have a feature called dynamic contrast, invented by Philips researchers Douglas Stanton, Martinus Stroomer and Adrianus de Vaan Using PWM (pulse-width modulation, a technology where the intensity of the LEDs are kept constant, but the brightness adjustment is achieved by varying a time interval of flashing these constant light intensity light sources), the backlight is dimmed to the brightest color that appears on the screen while simultaneously boosting the LCD contrast to the maximum achievable levels, allowing the 1000:1 contrast ratio of the LCD panel to be scaled to different light intensities, resulting in the "30000:1" contrast ratios seen in the advertising on some of these monitors. Since computer screen images usually have full white somewhere in the image, the backlight will usually be at full intensity, making this "feature" mostly a marketing gimmick for computer monitors, however for TV screens it drastically increases the perceived contrast ratio and dynamic range, improves the viewing angle dependency and drastically reducing the power consumption of conventional LCD televisions. WLED array: The LCD panel is lit by a full array of white LEDs placed behind a diffuser behind the panel. LCDs that use this implementation will usually have the ability to dim the LEDs in the dark areas of the image being displayed, effectively increasing the contrast ratio of the display. As of 2012, this design gets most of its use from upscale, larger-screen LCD televisions. RGB-LED array: Similar to the WLED array, except the panel is lit by a full array of RGB LEDs. While displays lit with white LEDs usually have a poorer color gamut than CCFL lit displays, panels lit with RGB LEDs have very wide color gamuts. This implementation is most popular on professional graphics editing LCDs. As of 2012, LCDs in this category usually cost more than $1000. As of 2016 the cost of this category has drastically reduced and such LCD televisions obtained same price levels as the former 28" (71 cm) CRT based categories. Today, most LCD screens are being designed with an LED backlight instead of the traditional CCFL backlight, while that backlight is dynamically controlled with the video information (dynamic backlight control). The combination with the dynamic backlight control, invented by Philips researchers Douglas Stanton, Martinus Stroomer and Adrianus de Vaan, simultaneously increases the dynamic range of the display system (also marketed as HDR, high dynamic range television. The LCD backlight systems are made highly efficient by applying optical films such as prismatic structure to gain the light into the desired viewer directions and reflective polarizing films that recycle the polarized light that was formerly absorbed by the first polarizer of the LCD (invented by Philips researchers Adrianus de Vaan and Paulus Schaareman), generally achieved using so called DBEF films manufactured and supplied by 3M. These polarizers consist of a large stack of uniaxial oriented birefringent films that reflect the former absorbed polarization mode of the light. Such reflective polarizers using uniaxial oriented polymerized liquid crystals (birefringent polymers or birefringent glue) are invented in 1989 by Philips researchers Dirk Broer, Adrianus de Vaan and Joerg Brambring. The combination of such reflective polarizers, and LED dynamic backlight control make today's LCD televisions far more efficient than the CRT-based sets, leading to a worldwide energy saving of 600 TWh (2017), equal to 10% of the electricity consumption of all households worldwide or equal to 2 times the energy production of all solar cells in the world. Due to the LCD layer that generates the desired high resolution images at flashing video speeds using very low power electronics in combination with these excellent LED based backlight technologies, LCD technology has become the dominant display technology for products such as televisions, desktop monitors, notebooks, tablets, smartphones and mobile phones. Although competing OLED technology is pushed to the market, such OLED displays do not feature the HDR capabilities like LCDs in combination with 2D LED backlight technologies have, reason why the annual market of such LCD-based products is still growing faster (in volume) than OLED-based products while the efficiency of LCDs (and products like portable computers, mobile phones and televisions) may even be further improved by preventing the light to be absorbed in the colour filters of the LCD. Although until today such reflective colour filter solutions are not yet implemented by the LCD industry and did not made it further than laboratory prototypes, such reflective colour filter solutions still likely will be implemented by the LCD industry to increase the performance gap with OLED technologies). A standard television receiver screen, an LCD panel today in 2017, has over six million pixels, and they are all individually powered by a wire network embedded in the screen. The fine wires, or pathways, form a grid with vertical wires across the whole screen on one side of the screen and horizontal wires across the whole screen on the other side of the screen. To this grid each pixel has a positive connection on one side and a negative connection on the other side. So the total amount of wires needed is 3 x 1920 going vertically and 1080 going horizontally for a total of 6840 wires horizontally and vertically. That's three for red, green and blue and 1920 columns of pixels for each color for a total of 5760 wires going vertically and 1080 rows of wires going horizontally. For a panel that is 28.8 inches (73 centimeters) wide, that means a wire density of 200 wires per inch along the horizontal edge. The LCD panel is powered by LCD drivers that are carefully matched up with the edge of the LCD panel at the factory level. These same principles apply also for smart phone screens that are so much smaller than TV screens. LCD panels typically use thinly-coated metallic conductive pathways on a glass substrate to form the cell circuitry to operate the panel. It is usually not possible to use soldering techniques to directly connect the panel to a separate copper-etched circuit board. Instead, interfacing is accomplished using either adhesive plastic ribbon with conductive traces glued to the edges of the LCD panel, or with an elastomeric connector, which is a strip of rubber or silicone with alternating layers of conductive and insulating pathways, pressed between contact pads on the LCD and mating contact pads on a circuit board. Monochrome and later color passive-matrix LCDs were standard in most early laptops (although a few used plasma displays) and the original Nintendo Game Boy until the mid-1990s, when color active-matrix became standard on all laptops. The commercially unsuccessful Macintosh Portable (released in 1989) was one of the first to use an active-matrix display (though still monochrome). Passive-matrix LCDs are still used in the 2010s for applications less demanding than laptop computers and TVs, such as inexpensive calculators. In particular, these are used on portable devices where less information content needs to be displayed, lowest power consumption (no backlight) and low cost are desired or readability in direct sunlight is needed. A comparison between a blank passive-matrix display (top) and a blank active-matrix display (bottom). A passive-matrix display can be identified when the blank background is more grey in appearance than the crisper active-matrix display, fog appears on all edges of the screen, and while pictures appear to be fading on the screen. Bistable LCDs do not require continuous refreshing. Rewriting is only required for picture information changes. In 1984 HA van Sprang and AJSM de Vaan invented an STN type display that could be operated in a bistable mode, enabling extreme high resolution images up to 4000 lines or more using only low voltages. Since a pixel however may be either in an on-state or in an off state at the moment new information needs to be written to that particular pixel, the addressing method of these bistable displays is rather complex, reason why these displays did not made it to the market. That changed when in the 2010 "zero-power" (bistable) LCDs became available. Potentially, passive-matrix addressing can be used with devices if their write/erase characteristics are suitable, which was the case for ebooks showing still pictures only. After a page is written to the display, the display may be cut from the power while that information remains readable. This has the advantage that such ebooks may be operated long time on just a small battery only. 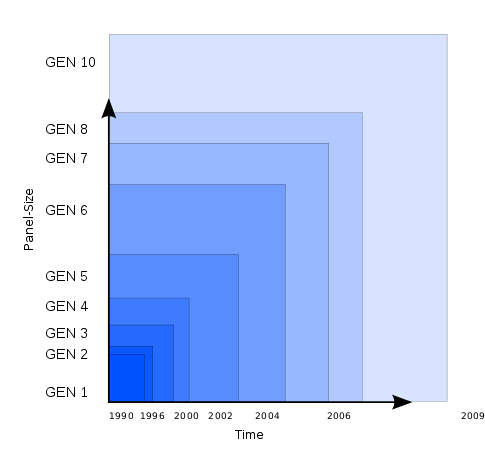 High-resolution color displays, such as modern LCD computer monitors and televisions, use an active-matrix structure. A matrix of thin-film transistors (TFTs) is added to the electrodes in contact with the LC layer. Each pixel has its own dedicated transistor, allowing each column line to access one pixel. When a row line is selected, all of the column lines are connected to a row of pixels and voltages corresponding to the picture information are driven onto all of the column lines. The row line is then deactivated and the next row line is selected. All of the row lines are selected in sequence during a refresh operation. Active-matrix addressed displays look brighter and sharper than passive-matrix addressed displays of the same size, and generally have quicker response times, producing much better images. Twisted nematic displays contain liquid crystals that twist and untwist at varying degrees to allow light to pass through. When no voltage is applied to a TN liquid crystal cell, polarized light passes through the 90-degrees twisted LC layer. In proportion to the voltage applied, the liquid crystals untwist changing the polarization and blocking the light's path. By properly adjusting the level of the voltage almost any gray level or transmission can be achieved. In-plane switching is an LCD technology that aligns the liquid crystals in a plane parallel to the glass substrates. In this method, the electrical field is applied through opposite electrodes on the same glass substrate, so that the liquid crystals can be reoriented (switched) essentially in the same plane, although fringe fields inhibit a homogeneous reorientation. This requires two transistors for each pixel instead of the single transistor needed for a standard thin-film transistor (TFT) display. Before LG Enhanced IPS was introduced in 2009, the additional transistors resulted in blocking more transmission area, thus requiring a brighter backlight and consuming more power, making this type of display less desirable for notebook computers. Currently Panasonic is using an enhanced version eIPS for their large size LCD-TV products as well as Hewlett-Packard in its WebOS based TouchPad tablet and their Chromebook 11. In 2011, LG claimed the smartphone LG Optimus Black (IPS LCD (LCD NOVA)) has the brightness up to 700 nits, while the competitor has only IPS LCD with 518 nits and double an active-matrix OLED (AMOLED) display with 305 nits. LG also claimed the NOVA display to be 50 percent more efficient than regular LCDs and to consume only 50 percent of the power of AMOLED displays when producing white on screen. When it comes to contrast ratio, AMOLED display still performs best due to its underlying technology, where the black levels are displayed as pitch black and not as dark gray. On August 24, 2011, Nokia announced the Nokia 701 and also made the claim of the world's brightest display at 1000 nits. The screen also had Nokia's Clearblack layer, improving the contrast ratio and bringing it closer to that of the AMOLED screens. Super-IPS was later introduced after in-plane switching with even better response times and color reproduction. Known as fringe field switching (FFS) until 2003, advanced fringe field switching is similar to IPS or S-IPS offering superior performance and color gamut with high luminosity. AFFS was developed by Hydis Technologies Co., Ltd, Korea (formally Hyundai Electronics, LCD Task Force). AFFS-applied notebook applications minimize color distortion while maintaining a wider viewing angle for a professional display. Color shift and deviation caused by light leakage is corrected by optimizing the white gamut which also enhances white/gray reproduction. In 2004, Hydis Technologies Co., Ltd licensed AFFS to Japan's Hitachi Displays. Hitachi is using AFFS to manufacture high-end panels. In 2006, HYDIS licensed AFFS to Sanyo Epson Imaging Devices Corporation. Shortly thereafter, Hydis introduced a high-transmittance evolution of the AFFS display, called HFFS (FFS+). Hydis introduced AFFS+ with improved outdoor readability in 2007. AFFS panels are mostly utilized in the cockpits of latest commercial aircraft displays. However, it is no longer produced as of February 2015. Vertical-alignment displays are a form of LCDs in which the liquid crystals naturally align vertically to the glass substrates. When no voltage is applied, the liquid crystals remain perpendicular to the substrate, creating a black display between crossed polarizers. When voltage is applied, the liquid crystals shift to a tilted position, allowing light to pass through and create a gray-scale display depending on the amount of tilt generated by the electric field. It has a deeper-black background, a higher contrast ratio, a wider viewing angle, and better image quality at extreme temperatures than traditional twisted-nematic displays. Blue phase mode LCDs have been shown as engineering samples early in 2008, but they are not in mass-production. The physics of blue phase mode LCDs suggest that very short switching times (≈1 ms) can be achieved, so time sequential color control can possibly be realized and expensive color filters would be obsolete. Some LCD panels have defective transistors, causing permanently lit or unlit pixels which are commonly referred to as stuck pixels or dead pixels respectively. Unlike integrated circuits (ICs), LCD panels with a few defective transistors are usually still usable. Manufacturers' policies for the acceptable number of defective pixels vary greatly. At one point, Samsung held a zero-tolerance policy for LCD monitors sold in Korea. As of 2005, though, Samsung adheres to the less restrictive ISO 13406-2 standard. Other companies have been known to tolerate as many as 11 dead pixels in their policies. Dead pixel policies are often hotly debated between manufacturers and customers. To regulate the acceptability of defects and to protect the end user, ISO released the ISO 13406-2 standard. However, not every LCD manufacturer conforms to the ISO standard and the ISO standard is quite often interpreted in different ways. LCD panels are more likely to have defects than most ICs due to their larger size. For example, a 300 mm SVGA LCD has 8 defects and a 150 mm wafer has only 3 defects. However, 134 of the 137 dies on the wafer will be acceptable, whereas rejection of the whole LCD panel would be a 0% yield. In recent years, quality control has been improved. An SVGA LCD panel with 4 defective pixels is usually considered defective and customers can request an exchange for a new one. [according to whom?] Some manufacturers, notably in South Korea where some of the largest LCD panel manufacturers, such as LG, are located, now have a zero-defective-pixel guarantee, which is an extra screening process which can then determine "A"- and "B"-grade panels. [original research?] Many manufacturers would replace a product even with one defective pixel. Even where such guarantees do not exist, the location of defective pixels is important. A display with only a few defective pixels may be unacceptable if the defective pixels are near each other. LCD panels also have defects known as clouding (or less commonly mura), which describes the uneven patches of changes in luminance. It is most visible in dark or black areas of displayed scenes. The zenithal bistable device (ZBD), developed by Qinetiq (formerly DERA), can retain an image without power. The crystals may exist in one of two stable orientations ("black" and "white") and power is only required to change the image. ZBD Displays is a spin-off company from QinetiQ who manufactured both grayscale and color ZBD devices. Kent Displays has also developed a "no-power" display that uses polymer stabilized cholesteric liquid crystal (ChLCD). In 2009 Kent demonstrated the use of a ChLCD to cover the entire surface of a mobile phone, allowing it to change colors, and keep that color even when power is removed. In 2004 researchers at the University of Oxford demonstrated two new types of zero-power bistable LCDs based on Zenithal bistable techniques. Several bistable technologies, like the 360° BTN and the bistable cholesteric, depend mainly on the bulk properties of the liquid crystal (LC) and use standard strong anchoring, with alignment films and LC mixtures similar to the traditional monostable materials. Other bistable technologies, e.g., BiNem technology, are based mainly on the surface properties and need specific weak anchoring materials. Resolution The resolution of an LCD is expressed by the number of columns and rows of pixels (e.g., 1024×768). Each pixel is usually composed 3 sub-pixels, a red, a green, and a blue one. This had been one of the few features of LCD performance that remained uniform among different designs. However, there are newer designs that share sub-pixels among pixels and add Quattron which attempt to efficiently increase the perceived resolution of a display without increasing the actual resolution, to mixed results. Spatial performance: For a computer monitor or some other display that is being viewed from a very close distance, resolution is often expressed in terms of dot pitch or pixels per inch, which is consistent with the printing industry. Display density varies per application, with televisions generally having a low density for long-distance viewing and portable devices having a high density for close-range detail. The Viewing Angle of an LCD may be important depending on the display and its usage, the limitations of certain display technologies mean the display only displays accurately at certain angles. Temporal performance: the temporal resolution of an LCD is how well it can display changing images, or the accuracy and the number of times per second the display draws the data it is being given. LCD pixels do not flash on/off between frames, so LCD monitors exhibit no refresh-induced flicker no matter how low the refresh rate. But a lower refresh rate can mean visual artefacts like ghosting or smearing, especially with fast moving images. Individual pixel response time is also important, as all displays have some inherent latency in displaying an image which can be large enough to create visual artifacts if the displayed image changes rapidly. Color performance: There are multiple terms to describe different aspects of color performance of a display. Color gamut is the range of colors that can be displayed, and color depth, which is the fineness with which the color range is divided. Color gamut is a relatively straight forward feature, but it is rarely discussed in marketing materials except at the professional level. Having a color range that exceeds the content being shown on the screen has no benefits, so displays are only made to perform within or below the range of a certain specification. There are additional aspects to LCD color and color management, such as white point and gamma correction, which describe what color white is and how the other colors are displayed relative to white. Brightness and contrast ratio: Contrast ratio is the ratio of the brightness of a full-on pixel to a full-off pixel. The LCD itself is only a light valve and does not generate light; the light comes from a backlight that is either fluorescent or a set of LEDs. Brightness is usually stated as the maximum light output of the LCD, which can vary greatly based on the transparency of the LCD and the brightness of the backlight. In general, brighter is better, but there is always a trade-off between brightness and power consumption. Some of these issues relate to full-screen displays, others to small displays as on watches, etc. Many of the comparisons are with CRT displays. Very compact, thin and light, especially in comparison with bulky, heavy CRT displays. Low power consumption. Depending on the set display brightness and content being displayed, the older CCFT backlit models typically use less than half of the power a CRT monitor of the same size viewing area would use, and the modern LED backlit models typically use 10–25% of the power a CRT monitor would use. Little heat emitted during operation, due to low power consumption. Sharp image with no bleeding or smearing when operated at native resolution. Emits almost no undesirable electromagnetic radiation (in the extremely low frequency range), unlike a CRT monitor. No theoretical resolution limit. When multiple LCD panels are used together to create a single canvas, each additional panel increases the total resolution of the display, which is commonly called stacked resolution. Can be made in large sizes of over 80-inch (2 m) diagonal. Masking effect: the LCD grid can mask the effects of spatial and grayscale quantization, creating the illusion of higher image quality. Unaffected by magnetic fields, including the Earth's. As an inherently digital device, the LCD can natively display digital data from a DVI or HDMI connection without requiring conversion to analog. Some LCD panels have native fiber optic inputs in addition to DVI and HDMI. Many LCD monitors are powered by a 12 V power supply, and if built into a computer can be powered by its 12 V power supply. Can be made with very narrow frame borders, allowing multiple LCD screens to be arrayed side-by-side to make up what looks like one big screen. 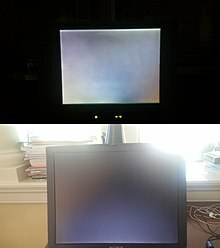 Limited viewing angle in some older or cheaper monitors, causing color, saturation, contrast and brightness to vary with user position, even within the intended viewing angle. Uneven backlighting in some monitors (more common in IPS-types and older TNs), causing brightness distortion, especially toward the edges ("backlight bleed"). Black levels may not be as dark as required because individual liquid crystals cannot completely block all of the backlight from passing through. As of 2012, most implementations of LCD backlighting use pulse-width modulation (PWM) to dim the display, which makes the screen flicker more acutely (this does not mean visibly) than a CRT monitor at 85 Hz refresh rate would (this is because the entire screen is strobing on and off rather than a CRT's phosphor sustained dot which continually scans across the display, leaving some part of the display always lit), causing severe eye-strain for some people. Unfortunately, many of these people don't know that their eye-strain is being caused by the invisible strobe effect of PWM. This problem is worse on many LED-backlit monitors, because the LEDs switch on and off faster than a CCFL lamp. Only one native resolution. Displaying any other resolution either requires a video scaler, causing blurriness and jagged edges, or running the display at native resolution using 1:1 pixel mapping, causing the image either not to fill the screen (letterboxed display), or to run off the lower or right edges of the screen. Fixed bit depth (also called color depth). Many cheaper LCDs are only able to display 262,000 colors. 8-bit S-IPS panels can display 16 million colors and have significantly better black level, but are expensive and have slower response time. Low refresh rate. All but a few high-end monitors support no higher than 60 or 75 Hz; while this does not cause visible flicker due to the LCD panel's high internal refresh rate, the low input refresh rate limits the maximum frame-rate that can be displayed, affecting gaming and 3D graphics. Input lag, because the LCD's A/D converter waits for each frame to be completely been output before drawing it to the LCD panel. Many LCD monitors do post-processing before displaying the image in an attempt to compensate for poor color fidelity, which adds an additional lag. Further, a video scaler must be used when displaying non-native resolutions, which adds yet more time lag. Scaling and post processing are usually done in a single chip on modern monitors, but each function that chip performs adds some delay. Some displays have a video gaming mode which disables all or most processing to reduce perceivable input lag. Dead or stuck pixels may occur during manufacturing or after a period of use. A stuck pixel will glow with color even on an all-black screen, while a dead one will always remain black. Subject to burn-in effect, although the cause differs from CRT and the effect may not be permanent, a static image can cause burn-in in a matter of hours in badly designed displays. In a constant-on situation, thermalization may occur in case of bad thermal management, in which part of the screen has overheated and looks discolored compared to the rest of the screen. Loss of brightness and much slower response times in low temperature environments. In sub-zero environments, LCD screens may cease to function without the use of supplemental heating. Loss of contrast in high temperature environments. Several different families of liquid crystals are used in liquid crystals. The molecules used have to be anisotropic, and to exhibit mutual attraction. Polarizable rod-shaped molecules (biphenyls, terphenyls, etc.) are common. A common form is a pair of aromatic benzene rings, with a nonpolar moiety (pentyl, heptyl, octyl, or alkyl oxy group) on one end and polar (nitrile, halogen) on the other. Sometimes the benzene rings are separated with an acetylene group, ethylene, CH=N, CH=NO, N=N, N=NO, or ester group. In practice, eutectic mixtures of several chemicals are used, to achieve wider temperature operating range (-10..+60 °C for low-end and -20..+100 °C for high-performance displays). For example, the E7 mixture is composed of three biphenyls and one terphenyl: 39 wt.% of 4'-pentyl[1,1'-biphenyl]-4-carbonitrile (nematic range 24..35 °C), 36 wt.% of 4'-heptyl[1,1'-biphenyl]-4-carbonitrile (nematic range 30..43 °C), 16 wt.% of 4'-octoxy[1,1'-biphenyl]-4-carbonitrile (nematic range 54..80 °C), and 9 wt.% of 4-pentyl[1,1':4',1-terphenyl]-4-carbonitrile (nematic range 131..240 °C). ^ "Definition of LCD". www.merriam-webster.com. ^ "LCD Image Persistence". Fujitsu technical support. Fujitsu. Archived from the original on April 23, 2012. Retrieved December 11, 2011. ^ Castellano, Joseph A (2005). Liquid Gold: The Story of Liquid Crystal Displays and the Creation of an Industry. World Scientific Publishing. ISBN 978-981-238-956-5. ^ Datta, Asit Kumar; Munshi, Soumika (November 25, 2016). Information Photonics: Fundamentals, Technologies, and Applications. CRC Press. ISBN 9781482236422. ^ a b c d e f AU Optronics Corp. (AUO): "Size Matters" 19 January 2017. ^ a b c d Gan, Fuxi: From Optical Glass to Photonic Glass, Photonic Glasses, Pages 1–38. ^ Armorex Taiwan Central Glass Company, Abgerufen am 20. Mai 2015. ^ Samsung: SAMSUNG Electronics Announces 7th-Generation TFT LCD Glass Substrate, Press release 27 March 2003, Visited 2. August 2010. ^ "High-definition display, display, intelligent system, health services, BOE, BOE official website". www.boe.com. Retrieved April 10, 2019. ^ "Company History - Sakai Display Products Corporation". www.sdp.co.jp. Retrieved April 10, 2019. ^ Shih, Willy. "How Did They Make My Big-Screen TV? A Peek Inside China's Massive BOE Gen 10.5 Factory". Forbes. Retrieved April 10, 2019. ^ BOE’s Gen 10.5 Display Equipment Is A Pie In The Sky For Korean Equipment Companies ETNews, Visited 10 July 2015. ^ Liquid Gold: The Story of Liquid Crystal Displays and the Creation of an Industry, Joseph A. Castellano, 2005 World Scientific Publishing Co. Pte. Ltd., ISBN 981-238-956-3. ^ Kawamoto, Hiroshi (2002). "The History of Liquid-Crystal Displays" (PDF). Proceedings of the IEEE. 90 (4): 460–500. doi:10.1109/JPROC.2002.1002521. ^ "First-Hand Histories: Liquid Crystal Display Evolution — Swiss Contributions". Engineering and Technology History Wiki. ETHW. Retrieved June 30, 2017. ^ Jonathan W. Steed & Jerry L. Atwood (2009). Supramolecular Chemistry (2nd ed.). John Wiley and Sons. p. 844. ISBN 978-0-470-51234-0. ^ Gray, George W.; Kelly, Stephen M. (1999). "Liquid crystals for twisted nematic display devices". Journal of Materials Chemistry. 9 (9): 2037–2050. doi:10.1039/a902682g. ^ Williams, R. (1963). "Domains in liquid crystals". J. Phys. Chem. 39 (2): 382–388. doi:10.1063/1.1734257. ^ a b Castellano, Joseph A. (2006). "Modifying Light". American Scientist. 94 (5): 438–445. doi:10.1511/2006.61.438. ^ Heilmeier, George; Castellano, Joseph; Zanoni, Louis (1969). "Guest-Host Interactions in Nematic Liquid Crystals". Molecular Crystals and Liquid Crystals. 8: 293–304. doi:10.1080/15421406908084910. ^ Heilmeier, G. H.; Zanoni, L. A.; Barton, L. A. (1968). "Dynamic scattering: A new electrooptic effect in certain classes of nematic liquid crystals". Proc. IEEE. 56 (7): 1162–1171. doi:10.1109/proc.1968.6513. ^ Gross, Benjamin (November 2012). "How RCA lost the LCD". IEEE Spectrum. 49 (11): 38–44. doi:10.1109/mspec.2012.6341205. ^ "Milestones: Liquid Crystal Display, 1968". IEEE Global History Network. IEEE. Retrieved August 4, 2011. ^ "Modifying Light". American Scientist Online. Archived from the original on December 20, 2008. Retrieved December 28, 2007. ^ "Driving arrangement for passive time indicating devices". Retrieved April 10, 2019. ^ Brody, T.P., "Birth of the Active Matrix", Information Display, Vol. 13, No. 10, 1997, pp. 28–32. ^ "Liquid crystal display units". Retrieved April 10, 2019. ^ "Liquid crystal color display device". Retrieved April 10, 2019. ^ "Liquid crystal display device". Retrieved April 10, 2019. ^ "Liquid crystal display unit of matrix type". Retrieved April 10, 2019. ^ European Patent No. EP 0131216: Amstutz H., Heimgartner D., Kaufmann M., Scheffer T.J., "Flüssigkristallanzeige," Oct. 28, 1987. ^ "TV Watch - Epson". global.epson.com. Retrieved April 10, 2019. ^ "Espacenet — Bibliographic data". Worldwide.espacenet.com. September 10, 1974. Retrieved August 15, 2014. ^ U.S. Patent 3,834,794: R. Soref, Liquid crystal electric field sensing measurement and display device, filed June 28, 1973. ^ "Espacenet — Bibliographic data". Worldwide.espacenet.com. November 19, 1996. Retrieved August 15, 2014. ^ U.S. Patent 5,576,867: G. Baur, W. Fehrenbach, B. Staudacher, F. Windscheid, R. Kiefer, Liquid crystal switching elements having a parallel electric field and betao which is not 0 or 90 degrees, filed Jan 9, 1990. ^ "Espacenet — Bibliographic data". Worldwide.espacenet.com. January 28, 1997. Retrieved August 15, 2014. ^ "Optical Patterning" (PDF). Nature. August 22, 1996. Retrieved June 13, 2008. ^ Competing display technologies for the best image performance; A.J.S.M. de Vaan; Journal of the society of information displays, Volume 15, Issue 9 September 2007 Pages 657–666; http://onlinelibrary.wiley.com/doi/10.1889/1.2785199/abstract? ^ "Worldwide LCD TV shipments surpass CRTs for first time ever". engadgetHD. February 19, 2008. Retrieved June 13, 2008. ^ "Displaybank's Global TV Market Forecasts for 2008 – Global TV market to surpass 200 million units". Displaybank. December 5, 2007. Retrieved June 13, 2008. ^ "IHS Acquires Displaybank, a Global Leader in Research and Consulting in the Flat-Panel Display Industry — IHS Technology". technology.ihs.com. ^ "Toshiba announces 6.1 inch LCD panel with an insane resolution of 2560 x 1600 pixels". October 24, 2011. ^ Explanation of different LCD monitor technologies, "Monitor buying guide — CNET Reviews", Eric Franklin, Retrieved September 2012. ^ Explanation of CCFL backlighting details, "Design News — Features — How to Backlight an LCD" Archived January 2, 2014, at the Wayback Machine, Randy Frank, Retrieved January 2013. ^ LG Training Center. 2012 Understanding LCD T-CON Training Presentation, p. 7. ^ [Sites.csn.edu/jmiller/et/et238b/sencore-lcd-theory.pdf "LCD (Liquid Crystal Display) Color Monitor Introduction, p. 14"] Check |url= value (help) (PDF). ^ Future Electronics. Parts list, LCD Display Drivers. ^ "Compaq Portable III". Retrieved July 20, 2015. ^ Eric Wasatonicundefined (Director). IBM PS/2 P70 Portable Computer — Vintage PLASMA Display. ^ "GameBoy : User Manual, Page 12". February 12, 2011. Retrieved February 12, 2011. ^ T.J. Scheffer and J. Nehring,"A new highly multiplexable LCD," Appl. Phys. Lett., vol. 48, no. 10, pp. 1021–1023, Nov. 1984. ^ P. J. Wild, Matrix-addressed liquid crystal projection display, Digest of Technical Papers, International Symposium, Society for Information Display, June 1972, pp. 62–63. ^ P. M. Alt, P. Pleshko Scanning limitations of liquid-crystal displays, IEEE Trans. Electron Devices, vol. ED-21, pp. 146–155, Feb. 1974. ^ "LG Optimus Black Nova Display vs Galaxy S Super Amoled". Archived from the original on September 3, 2011. Retrieved September 14, 2011. ^ "LCD Panel Technology Explained". Retrieved January 13, 2012. ^ "AFFS & AFFS+". Technology. Vertex LCD Inc. Archived from the original on May 18, 2016. Retrieved June 15, 2009. ^ K. H. Lee; H. Y. Kim; K. H. Park; S. J. Jang; I. C. Park & J. Y. Lee (June 2006). "A Novel Outdoor Readability of Portable TFT-LCD with AFFS Technology". SID Symposium Digest of Technical Papers. 37 (1): 1079–1082. doi:10.1889/1.2433159. ^ Jack H. Park (January 15, 2015). "Cut and Run: Taiwan-controlled LCD Panel Maker in Danger of Shutdown without Further Investment". www.businesskorea.co.kr. Archived from the original on May 12, 2015. Retrieved April 23, 2015. ^ "S Korea workers in Taipei rally over factory closures". www.taipeitimes.com. February 13, 2015. ^ "Xplore Technologies acquires Motion -- How it came about". www.ruggedpcreview.com. April 17, 2015. ^ NXP Semiconductors (October 21, 2011). "UM10764 Vertical Alignment (VA) displays and NXP LCD drivers" (PDF). Retrieved September 4, 2014. ^ "Samsung to Offer 'Zero-PIXEL-DEFECT' Warranty for LCD Monitors". Forbes. December 30, 2004. Retrieved September 3, 2007. ^ "What is Samsung's Policy on dead pixels?". Samsung. February 5, 2005. Archived from the original on March 4, 2007. Retrieved August 3, 2007. ^ "Display (LCD) replacement for defective pixels – ThinkPad". Lenovo. June 25, 2007. Retrieved July 13, 2007. ^ "What is the ISO 13406-2 standard for LCD screen pixel faults?". Anders Jacobsen's blog. January 4, 2006. ^ "Sony XBR Mura". Hdtvtest.co.uk. March 31, 2007. Retrieved August 15, 2014. ^ Tetsuo Nozawa. "[SID] Entire Surface of Handset becomes LCD". Nikkei Tech-On. Retrieved June 10, 2009. ^ Chidi Uche. "Development of bistable displays". University of Oxford. Archived from the original on May 23, 2008. Retrieved July 13, 2007. ^ "Contemporary LCD Monitor Parameters: Objective and Subjective Analysis (page 3)". Xbitlabs.com. January 23, 2007. Archived from the original on November 1, 2014. Retrieved August 15, 2014. ^ Tom's Hardware: Power Consumption Benchmark Results for CRT versus TFT LCD "Benchmark Results: Different Brightness Testing"
^ "A Comparison of Video Wall Technologies White Paper" (PDF). CineMassive. p. 7. Retrieved May 14, 2015. ^ M. d'Zmura, T. P. Janice Shen, Wei Wu, Homer Chen, and Marius Vassiliou (1998), "Contrast Gain Control for Color Image Quality," IS&T/SPIE Conference on Human Vision and Electronic Imaging III, San Jose, California, January 1998, SPIE Vol. 3299, 194-201. ^ "CineMassive CineView II LCD panel". Retrieved May 14, 2015. ^ Explanation of why pulse width modulated backlighting is used, and its side-effects, "Pulse Width Modulation on LCD monitors", TFT Central. Retrieved June 2012. ^ Discussions of severe eye strain with the new MacBook Pro, "Eye strain from LED backlighting in MacBook Pro", Apple Support Communities. Retrieved June 2012. ^ A discussion of LCD monitor eye strain, "Is an LED monitor better for eyes than an LCD? ", SuperUser. Retrieved June 2012. ^ An enlightened user requests Dell to improve their LCD backlights, "Request to Dell for higher backlight PWM frequency" Archived December 13, 2012, at the Wayback Machine, Dell Support Community. Retrieved June 2012. ^ "besttvforgaming.net". besttvforgaming.net. Archived from the original on April 1, 2012. Retrieved August 15, 2014. ^ Rabilloud, Guy. High-Performance Polymer... Editions OPHRYS. ISBN 9782710810957 – via Google Books. Wikimedia Commons has media related to Liquid crystal displays. Timothy J. Sluckin History of Liquid Crystals, a presentation and extracts from the book Crystals that Flow: Classic papers from the history of liquid crystals. David Dunmur & Tim Sluckin (2011) Soap, Science, and Flat-screen TVs: a history of liquid crystals, Oxford University Press ISBN 978-0-19-954940-5. Oleg Artamonov (January 23, 2007). "Contemporary LCD Monitor Parameters: Objective and Subjective Analysis". X-bit labs. Archived from the original on May 16, 2008. Retrieved May 17, 2008. LCD Phase and Clock Adjustment, Techmind offers a free test screen to get a better LCD picture quality than the LCD's auto-tune function. Liquid crystals are distributed by Merck Group (DE), and Yancheng Smiling (CN). This page was last edited on 20 April 2019, at 14:34 (UTC).